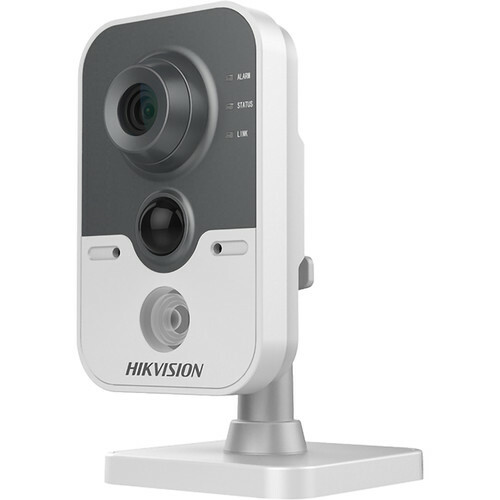 The DS-2CD2422FWD-IW 2MP Wi-Fi Network Cube Camera with Night Vision & 4mm Lens from Hikvision has a 1/2.7" progressive scan CMOS to capture 1920 x 1080 resolution video at up to 30 fps. This Wi-Fi camera has a night vision range up to 33'. Its 4mm fixed lens delivers a wide 88.9° horizontal field of view. Two-way audio is possible thanks to a built-in microphone and speaker. H.264 video compression keeps file sizes manageable while maintaining the best quality possible. Integrated PoE technology simplifies connectivity by enabling the transmission of data and power through one cable. An onboard microSD/SDHC/SDXC slot supports cards up to 128GB. microSD cards are available for purchase separately. This device is ONVIF-compliant for Profiles S and G, making it compatible with a wide range of surveillance devices. Box Dimensions (LxWxH) 9.0 x 5.85 x 4.25"